Jute industry is flourishing in India, with miscellany of Jute products, especially Jute Bags grabbing the attention of the customers in an apprised way. In the wide array of Jute Bags, Jute Pouch Bags have come into prominence as an intrinsic item complementing the new packaging trends. After governments ban on use of plastic bags, Pouch Jute Bags are being widely used by individuals and are recommended within the premises of malls, supermarket, shopping centers etc. Moreover, jute is a strong natural product, which makes the jute pouch bags easy to carry, more durable, easy handling in rough usage, etc. Prepared from the jute fiber these products are carbon neutral and can be easily decomposed after use. Moreover, these are recyclable, hence in every way preserves the environment. These bags are usually very capacious and used for supporting larger chunk of products. But considering current trends of small size handy portable jute bags, new small size Jute pouches also widely available in the market. Earlier, Jute Pouch Bags were available in the typical jute color, but in response to the big market demand, now-a-days better looking Jute Bags have hit the market; For example, today one can easily find attractive, colorful, beautifully printed and artistically decorated Jute Bags with variety of colors. These eco friendly jute pouch bags are often mixed and matched with fabric, velvet, embroidery work etc. As an apt fashionable trendy item, Pouch jute bags are getting popularity as a gift item. 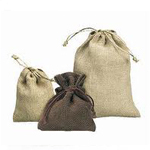 Leading gift's outlets keep proper collection of Jute Pouch Bags. These bags are usually used for personal use and also find application at different industries for packaging handy articles. Moreover, these bags are very economically priced, as compared to other range of Jute Pouch Bags available in the market. Besides, these can be easily customized over size, design, width, breadth etc.